B.B.B. is a very enjoyable wacky series taking place in NYC with the most bizarre cast of characters with no way to expect the unexpected. For newcomers to anime, this is a good way to start. Thankfully, a second season has been confirmed so I'd recommend many few this great series. Leonardo Watch finds himself in the crazy paranormal city known as Hellsalem Lot and a member of a group that specializes in protecting the innocent from the darker elements of this place. There he meets an ensemble cast that will change his life forever! Come for the insane action and hilarious comedy, and stay for the surprisingly strong story. BBB is one of the best action shows in years and is surprisingly under-looked despite all this. If you're a fan of Trigun, Baccano, My Hero Academia, Soul Eater, or Ushio & Tora, you need to see this ASAP. It's exactly what you're looking for. Now, I haven't watched season 1 in quite a while, but I know I've seen it at least 3 times because I loved the quirky characters, fast pace, and humor of the show. It did get a bit chaotic at times, and I almost never knew what was going on, but I loved it. Hence the multiple rewatches. Due to the nature of the show I had no trouble jumping straight in to season 2, and it's just as good, even better, than I remember. While I fell in love with the first OP, and the new one isn't quite as phenomenal to me yet, the soundtrack is overall as good as ever and fits the tone of the show perfectly. And I was laughing and smiling like an idiot the whole episode, I can't wait for more! A visual masterpiece that starts off strong but the confusing story hinders it. A show with a amazing first few episodes with brilliant world building and some awe inspiring animation that slowly becomes a mess with it's disjointed narrative about characters that you honestly don't really care about. Although it still has it's moments in the later episodes, the crazy and creative world seems to take a back seat at points for a story and ending that is just a confusing hot mess. With that all being said and done I'd say do yourself a favour and watch the first few episodes but stop watching when it starts to drag on because the world and the design is just that good. This is an anime that's simply put amazing. It has unique characters (Zapp, Zedd, Chain, etc) and a lovable atmosphere that's chaotic at the same time. If I were to put it, it'd be like Bongou No Stray Dogs- but with an EVEN more bizarre take. Furthermore, the abilities are pretty cool too; Klaus' blood abilities, Chain's abilities, and the All Seeing Eyes of God are good examples. I would DEFINITELY recommend this anime. Deserves so much more than one season. This show was a trip from beginning to end. There are a bunch of subplots and characters that could definitely be elaborated on in more seasons, but even with it's fast pacing it ended solid. The art and animation are actually really intricate and well done for an action anime...if you can take a minute to admire it. The show had a feel that was a cross between Durarara!! and Bungo Stray Dogs. I've watched a ton of anime in my life and I've honestly never have come across a 12-episode run that hooked me from the start and maintained the hype and energy all the way through. It even transcends the need for explanations. I'm usually a stickler for lore with the whys and hows events happen and magic exists. This is just character development and eye candy. Watch it! Found this show out of the blue a while back and never really got into. As a matter of fact the only reason I picked it up in the first place is because the reviews seemed pretty good. The perfect combo of action, comedy, and compelling stories. 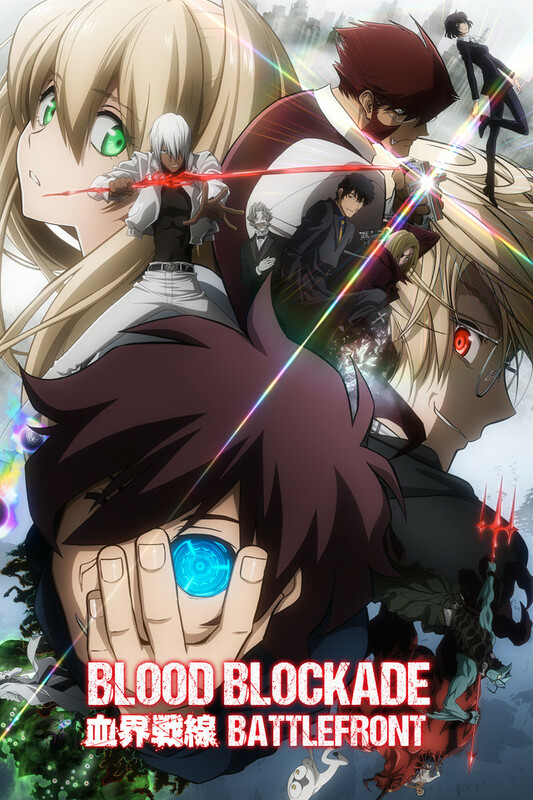 Blood Blockade Battlefront is a fantastic anime. Leonardo Watch is a type of character most people would normally overlook. However, BBB really let's him shine. The action in this anime is incredibly animated. The characters are lovable and packed with interesting quirks. In my experience, season 2 is usually where anime slows down a bit. This is NOT the case for Blood Blockade Battlefront. Honestly, if anything, it speeds up. BBB is worth your time. The music is awesome. The action is incredible. You'd be missing out, if you didn't see it. For a little reference, if you like My Hero Academia, you'll love this anime. There are a lot of characteristics of My Hero Academia that remind me of this show. Seriously give it a watch, the dub is great too! Only 2 episodes are anything less than spectacular and the rest is really wonderful. The action is slick, the dialogue is witty. What's not to love? The last episode actually had me crying. Can't wait for season 2!